Expanding the national, intercity rail system to strategic, underserved markets. Amtrak, on the other hand, must become a truly private entity focused solely on offering intercity passenger rail service. However, in order to “cut the cord” from the government, a number of changes must be made to allow Amtrak to eliminate its reliance on federal subsidies and ownership. 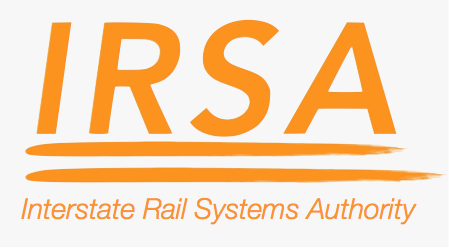 In terms of division of assets, IRSA would take ownership of all of Amtrak’s current trackage, stations, structures, and other property, which are currently valued at approximately $13 billion, exclusive of depreciation and amortization. Amtrak would retain ownership of its locomotives and rolling stock, currently valued at approximately $4 billion, exclusive of depreciation and amortization. Further, current liabilities of approximately $5 billion would be apportioned equitably based on the division of assets. In terms of revenues and expenses, IRSA would generate income in a number of different ways. 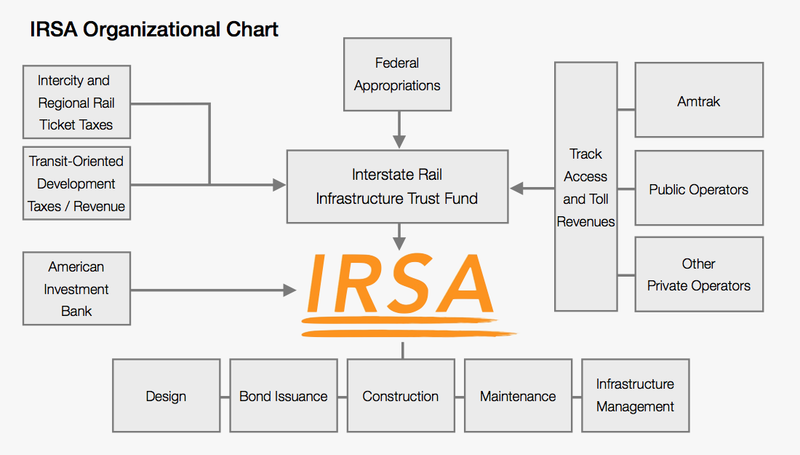 Like the Federal Highway Administration’s reliance on the Highway Trust Fund, IRSA would rely on a newly created Interstate Rail Infrastructure Trust Fund (“IRITF”) as its primary source of funding. Initial capital in the IRITF would come from the liquidation of assets that are non-essential to IRSA’s mission. This would include the sale of Amtrak-owned stations, platforms, and tracks exclusive of the Northeast Corridor right-of-way and trackage south of New York City. Relinquishing ownership of these assets would also allow local and state entities more in-tuned with the needs of a given train station or stretch of track to maintain them and make market-appropriate improvements. For instance, New York Penn Station, whose use is dominated by NJ Transit and MTA LIRR, would be sold to a local or state agency able to better care for the needs of New York and New Jersey commuters. The IRITF would also receive annual federal appropriations similar to those that have become necessary to finance the Highway Trust Fund. However, unlike the Highway Trust Fund, these federal appropriations would be stipulated from the inception of the trust fund and would be secured in longer-term funding increments, which would avoid the year-to-year negotiations that have threatened the fiscal stability of many highway and mass transit projects. In addition, the IRITF would collect track access and toll revenues from the various operators using its track assets, such as Amtrak, the various public operators and commuter systems, and future private operators. Finally, like the Highway Trust Fund, the IRITF would receive the proceeds of “user-fee” taxes. However, instead of a fuel tax, the IRITF would collect a passenger rail tax levied on intercity and regional rail tickets for trains utilizing IRSA’s track assets. Where track access and toll revenues would increase with an increased number of trains, user- fee taxes would increase with increased passenger ridership. Further, the IRITF would collect real estate taxes and revenues on transit-oriented developments created in conjunction with IRSA or through the sale of transferrable development rights. By designating multiple ways of replenishing the IRITF from its inception, IRSA will be able to rely on a secure source of annual funding and will avoid the problems that have destabilized the Highway Trust Fund. Finally, in addition to the IRITF, IRSA would also receive direct capital funding through a newly created American Investment Bank (“AIB”). The AIB, like the EIB, will be able to leverage government financing in order to raise additional private financing and offer below-market rate terms to qualified infrastructure projects such as the expansion of IRSA’s high-speed rail network along the Northeast Corridor. Without the availability of a federal subsidy, a fully privatized Amtrak must strike a balance between its successful and failing routes in order to remain profitable. Amtrak’s most successful routes generally have two things in common: 1) they are under 750 miles in total length; and 2) they do not offer full- service amenities. For trains traveling distances longer than 750 miles, the sheer number of intermediate stops typically reduces average speed to well-below comparable automobile or bus travel speeds. Because of these low average speeds and high overall travel times, long-distance routes require additional amenities and service, including sleeper cabins, dining cars with waiter service and multiple free meals, and the availability of checked baggage, which in turn drives up operational costs. 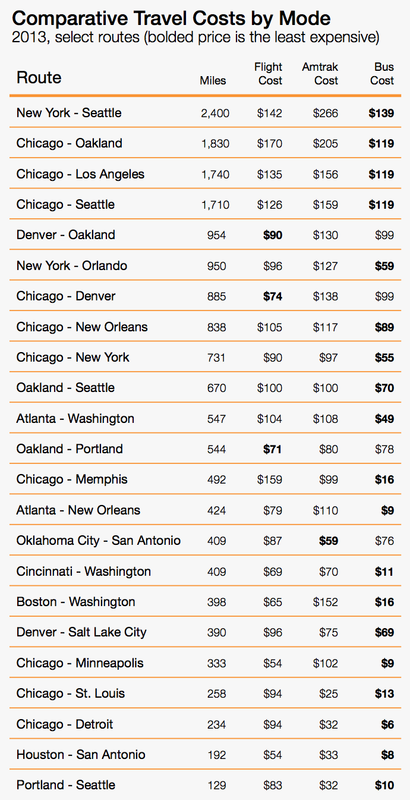 As a result, for many long-distance routes, air and bus travel are not only faster, but also less expensive, even with Amtrak pricing its long-distance fares at steep discounts below actual cost. The combination of these factors make Amtrak’s long-distance routes generally profit-prohibitive. Over the past five years alone, Amtrak’s long-distance operations have lost nearly $3 billion. This lack of profits has delayed infrastructure improvements and the acquisition of new rolling stock, which in turn has made long-distance rail travel more outdated and less enjoyable than comparable long-distance transport modes. Indeed, since 1990, long-distance rail ridership has decreased by 20%, whereas short-distance ridership has increased by nearly 300% over the same time period. The only reason why Amtrak continues to operate long-distance routes is because of their federally mandated mission and the availability of a federal operations subsidy. Because these routes operate at below cost, private bus and rail operators have been effectively shut out from competition in smaller markets currently without alternative intercity service options. In terms of short-distance routes, Northeast Corridor lines such as the Acela Express and Northeast Regional would continue to provide a significant portion of a newly privatized Amtrak’s profits. A number of other routes currently operating below 100% cost-recovery have, nevertheless, shown great ridership gains and positive profit elasticity in recent years. For instance, Hiawatha service, which runs between Chicago and Milwaukee, currently recovers 93% of its operation costs, and, over the past five years, for every one percent gain in ridership, it gained five percent in cost recovery. Amtrak should retain routes, such as Hiawatha service, whose profitability is positively impacted by increased ridership. On the other hand, a number of other short-distance lines, such as the Ethan Allen Express, Heartland Flyer, and Vermonter, have shown negative profit elasticity, meaning that they have actually increased their losses with increased ridership and revenue. Finally, many short-distance routes operate at annual deficits that are completely unsustainable and unsalvageable under a privatized Amtrak. For instance, in 2013, Wolverines service recovered only 45% of its operational costs and lost $50 for every ticket sold. There is no reason why Amtrak should retain short- distance routes along lines that have shown a consistent inability to grow ridership or increase profitability. Based on an analysis of Amtrak’s existing operations, and in order to remain profitable and ensure ridership gains in the future, Amtrak should retain service on the Northeast Corridor, select northeast routes, select midwest routes, select California routes, the Cascades line, and the Carolinian line. Amtrak should discontinue all of its remaining short-distance routes and all of its long-distance routes. Under PRIIA Section 209, Amtrak could either continue operating applicable short-distance routes in conjunction with state funding arrangements, or it could turn these operations completely over to the respective states. This reduction in service will, in the short term, reduce transportation options for those people who rely on these routes for intercity travel, especially in underserved and isolated rural markets. However, the reason why these routes need to be discontinued is because they are financially unsustainable. These routes have inhibited the modernization of Amtrak’s intercity passenger rail system in not just those failing markets, but also throughout the nation as a whole due to Amtrak’s current cost sharing financial structure. Nevertheless, without below-market Amtrak service, private operators will finally be able to fairly compete for riders along these discontinued corridors. Just as bus companies such as California Shuttle Bus, MegaBus, and BoltBus have filled previously underserved demand for discounted regional transit in California and the northeast, there is no reason why a privately operated “BoltTrain” or new bus operator cannot fill the gap in the markets that Amtrak would be discontinuing operations. Finally, if Amtrak or other future private rail operators are going to compete across all modes of intercity transportation, Congress must pass legislation to level the playing field by exempting intercity passenger rail workers from coverage under the RRA and FELA, which have both increased Amtrak’s labor costs above market rates for comparable jobs. Where these labor laws were originally meant to protect railroad employees from workplace dangers, a newly privatized Amtrak would no longer engage in many of the dangerous jobs that originally necessitated the passage of these labor laws. Amtrak’s labor costs have also risen, in part, due to its inability to effectively negotiate contracts with the almost 90% of its work force covered by labor agreements. As Amtrak continues to lose more and more money each year, unions continue to drive above-market wage increases without sufficient justification. These labor agreements also contain labor protection clauses, which guarantee termination payouts depending on the number of years a worker has been employed by Amtrak. On average, for each employee that Amtrak terminates, it faces approximately $200,000 in termination payments over the subsequent five years. The RRA, FELA, and various union agreements have resulted in an unsustainable long-term worker arrangement with disproportionately high labor costs. Last year, total employee compensation equaled 94% of Amtrak’s ticket revenue, and an onboard Amtrak worker made an average of $25.54 per hour in base wages. 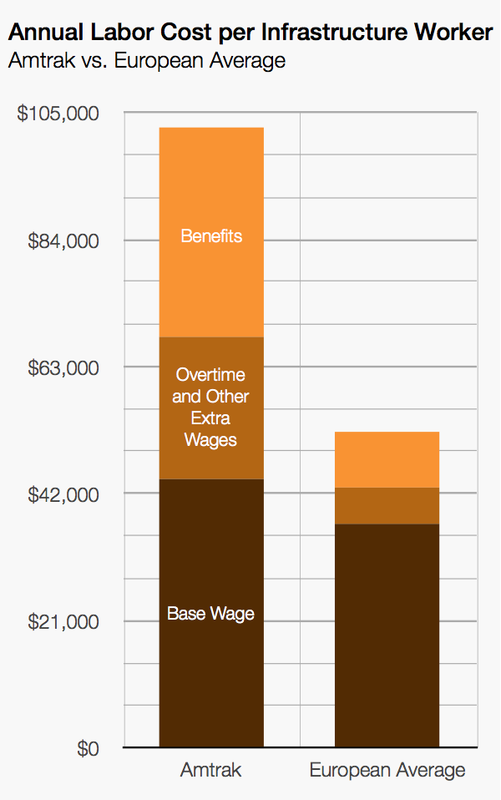 However, because of the high rate of employee contribution to a worker’s medical insurance, railroad retirement, post- employment benefits, dental insurance, disability insurance, life insurance, unemployment, railroad workers’ compensation under FELA, and administrative fees, Amtrak also paid an average of $15.65 per hour in additional employee benefits. In total, an average onboard worker (waiter, bartender, attendant, etc.) costs Amtrak $41.19 per hour in wages and benefits, and total compensation averaged approximately $102,500 per employee in 2013. By comparison, passenger trains run by the Alaska Railroad and Maine Eastern Railroad using independent contractors pay their onboard workers $8 to $13 per hour in base wages. In comparison with European operators, the largest discrepancy in labor costs comes from higher overtime pay and benefits per worker. If Amtrak were given a fresh start with exemptions from the RRA and FELA, private bargaining power, and a more consolidated business structure, it would be able to reduce its historically high labor costs and increase profitability. In order to achieve Amtrak privatization, there must be both a genuine sale of federally-held assets as well as a complete termination of federal oversight and subsidies. The most efficient and market-driven way to accomplish this goal is through an initial public offering, of which the federal government has relevant experience. In 1987, the federal government divested itself of Conrail, the federally-owned freight railroad based largely in the northeast and midwest, through an IPO that raised $1.7 billion. In the year prior to IPO, Conrail earned $431 million on revenues of $3.14 billion. Ten years later, a privatized Conrail was acquired by CSX for $8.4 billion in cash and stock. 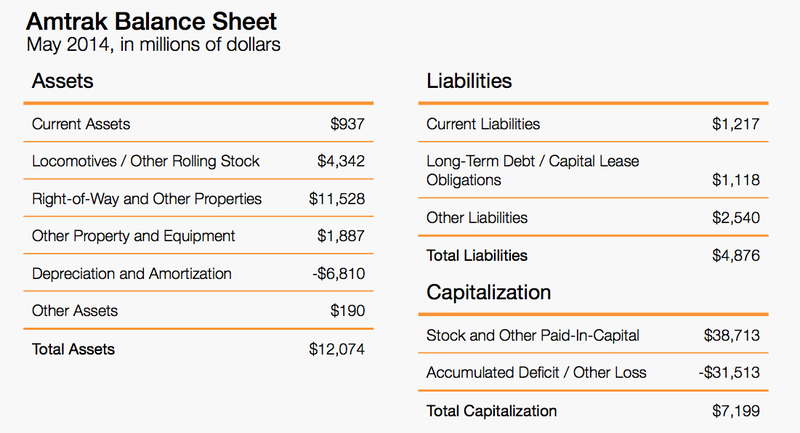 Compared with the divestiture of Conrail, which had been earning profits since 1981, the divestiture of Amtrak through an IPO presents numerous questions as to what the likely proceeds might be, considering that Amtrak has 1) never operated at a profit; 2) holds $1.4 billion in long-term debt; 3) has billions of dollars in deferred short and long-term capital improvements; and 4) has a number of unfunded labor expenses. However, by adopting the changes recommended in this report, Amtrak will achieve profitability from day one of its privatized operations, thus ensuring significant proceeds in an IPO. 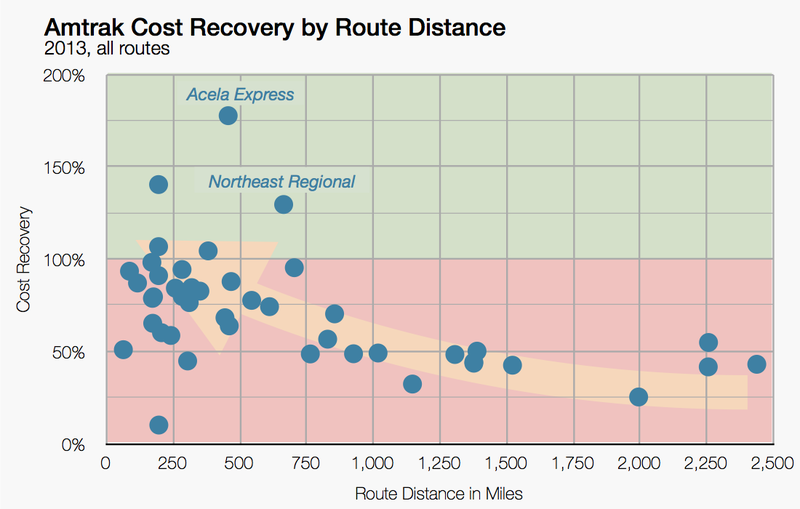 By its own projections, Amtrak estimates that the select routes identified for retention by this report, which include the Acela Express, Northeast Regional, Capitols, San Joaquin, Pacific Surfliner, Downeaster, Keystone, Washington Regional, Adirondack, Illinois Zephyr, Hiawatha, Missouri River Runner, Cascades, and Carolinian, will continue to generate significant income and profit growth. In 2013, these routes had a total ridership of 23.5 million passengers and earned $279 million on $1.7 billion in revenue and $1.4 billion in expenses, which amounted to an average of a 20% operational margin. 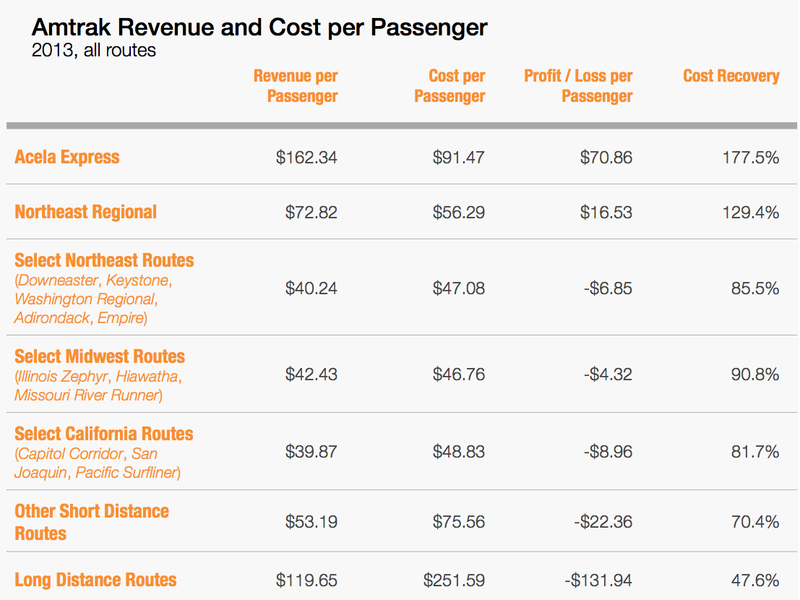 By comparison, in 2009, these routes only recovered 95% of their operating costs. Amtrak projects that by 2018, without making any changes to its business or financial structure, these select routes will earn $422 million in profits. With the changes recommended in this report, Amtrak will be able to increase its operational profitability significantly. One way to increase profitability is through the elimination of numerous shared costs that would not carry-over to a privatized Amtrak, such as capital infrastructure costs, certain depreciation and debt service costs, and discontinued route costs. The consolidation and streamlining of its business activities would also help to reduce administrative overhead and increase operational efficiency. Further, while Amtrak has taken considerable steps to eliminate a large portion of its long-term debt over the past decade, it would also be able to apply the proceeds of asset liquidation towards further reducing or eliminating its current long-term debt. Finally, a privatized Amtrak would be able to greatly increase its profitability if it were able to lower its labor costs through some of the recommended legislative reforms discussed earlier in this section. Overall, the privatization of Amtrak and creation of IRSA are not only feasible, but also necessary to ensure the long-term success of the nation’s intercity passenger rail system and creation of a modern high-speed rail network. Without comprehensive reforms, such as those discussed in this report, Amtrak will continue to lose billions of dollars each year, federal funding will remain unstable, and much-needed capital improvements will remain deferred.